Borrowed from Maori moa, from Proto-Polynesian *moa (“fowl”). 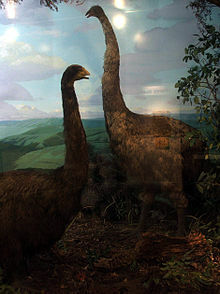 The moas (order Dinornithiformes) of New Zealand are likewise extinct but almost certainly some still survived when Tasman first sighted the islands in 1642. From Medieval Galician proper moa, from Latin mola (“millstone”), from Proto-Indo-European *melh₂- (“to grind”). Cognate of Portuguese mó and of Spanish muela. “moa” in Dicionario de Dicionarios do galego medieval, SLI - ILGA 2006-2012. “moa” in Dicionario de Dicionarios da lingua galega, SLI - ILGA 2006-2013. “moa” in Tesouro informatizado da lingua galega. Santiago: ILG. “moa” in Álvarez, Rosario (coord. ): Tesouro do léxico patrimonial galego e portugués, Santiago de Compostela: Instituto da Lingua Galega. Borrowed from French moi (“me”).